Home > News > The Origins of Migraine: Inside or Outside the Brain? The Origins of Migraine: Inside or Outside the Brain? Migraine is one of the most common and disabling chronic conditions throughout the world. The disorder is characterized by recurrent episodes of throbbing headache, often accompanied by nausea, vomiting, hypersensitivity to light and sound, and other sensory symptoms. Nonetheless, the mechanisms responsible for migraine are not fully understood. 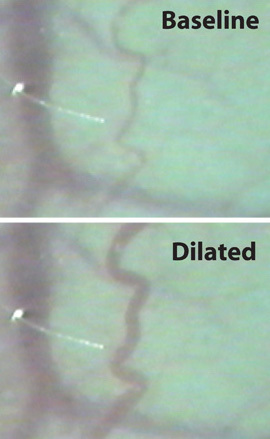 Now, consistent with current thinking that dilation of blood vessels is not the initiator of migraine, new findings from the labs of Simon Akerman, New York University, US, and Peter Goadsby, University of California, San Francisco, US, identify one possible way in which changes arising in the central nervous system (CNS) could result in migraine, independent of vasodilation. By comparing the effects of the neuropeptides vasoactive intestinal peptide (VIP) and pituitary adenylate cyclase-activating peptide (PACAP) on meningeal vasodilation and on sensitization of trigeminovascular neurons in anesthetized rats, the researchers identified a dissociation in the time-scale and pharmacology of the two molecules’ effects: While both peptides were able to cause immediate vasodilation of meningeal blood vessels, only PACAP caused a delayed, but prolonged increase in spontaneous trigeminovascular neuron activity and potentiated electrophysiological responses to intracranial or extracranial sensory stimulation. Notably, intracranial activation of these neurons seemed to require central, but not peripheral receptors, which the authors say indicates that migraine arises in the CNS. “At this point, vasodilation as the cause of migraine is probably done as a hypothesis,” said Greg Dussor, a migraine researcher at University of Texas, Dallas, US. However, despite the current findings, Dussor is unconvinced that migraine originates solely in the CNS. “It seems that there is a peripheral component and a central component, and you probably need both of them” to cause migraine, he added. The results were published October 7 in Science Translational Medicine. The idea that migraine results from vasodilation—the vascular theory of migraine—garnered support from early work showing that thermal, mechanical, or electrical stimulation of extra- or intracranial blood vessels produced pain, often reported as aching (Ray and Wolf, 1940). Others later argued that the beneficial effects of sumatriptan, a common therapy for migraine, result from the drug’s vasoconstrictor activity (Humphrey et al., 1990). In contrast, other studies have found that vasodilation is neither necessary nor sufficient for migraine (Olesen et al., 1990; see PRF related webinar). For example, intravenous (IV) administration of VIP dilated cranial arteries and caused headache but did not trigger migraine in migraineurs (Rahmann et al., 2008). In addition, although IV delivery of PACAP caused vasodilation and headache both in healthy subjects and those with a history of migraine, it only triggered delayed migraine in migraineurs (Winther Schytz et al., 2009). In order to better understand the causes of migraine, the investigators looked more closely at the effects of VIP and PACAP on vasodilation and neuronal activity. “We wanted to see what the difference was between these two molecules,” said Akerman. “If we saw different responses with PACAP compared to VIP, we might see an indication of a mechanism involved in migraine pathophysiology,” he added. As a first step, the authors examined vasodilation of dural meningeal blood vessels in response to IV administration of either of the two peptides, using in vivo blood vessel imaging in anesthetized rats. VIP or PACAP (specifically, the 38-amino-acid isoform PACAP-38) immediately increased the diameter of the meningeal vessels, as well as how long they were dilated, relative to baseline measurements. These results confirmed that both VIP and PACAP are potent vasodilators. To understand the pharmacology of vasodilation induced by VIP or PACAP, the authors next co-injected receptor antagonists with either of the two peptides. Although VIP and PACAP are different molecules, they are structurally similar and have shared G protein-coupled receptors, including VPAC1, VPAC2, and PAC1. IV administration of VIP or PACAP with relatively selective antagonists revealed that predominantly VPAC2 mediated vasodilation evoked by either molecule. Interestingly, using a model of neurogenic dural vasodilation (NDV) in which electrical stimulation of trigeminal afferent innervation of the dural meninges dilates blood vessels, the investigators found that electrical stimulation immediately increased vessel diameter, a change that was inhibited by a PAC1 antagonist. Therefore, vasodilation resulting from electrical stimulation seemed to require a different receptor than when arising from IV peptide infusion. The authors next compared the effects of the peptides on trigeminovascular neuron activity. Recordings were made from Aδ- and, to a lesser extent, C-fiber neurons located in the superficial and deep layers of the dorsal horn of the trigeminocervical complex. These were neurons activated by electrical stimulation of the trigeminal afferent innervation of the dural meninges, and responded to noxious and innocuous facial stimulation. In contrast to their similar effects on vasodilation, IV PACAP but not VIP (or saline as a control) provoked a delayed but prolonged increase in spontaneous trigeminovascular neuron activity, beginning at 90 minutes post-infusion and maintained for three hours. Moreover, PACAP but not VIP led to stronger responses to innocuous or noxious facial stimulation over a similar time-scale as the increase in spontaneous activity. The finding that PACAP triggered central neuron sensitization in a delayed fashion, whereas it caused vasodilation immediately, further undercut the vascular theory of migraine. In the previously described experiments, the peptides were delivered intravenously, but they are also able to cross the blood-brain barrier. PACAP could therefore cause sensitization of trigeminovascular neurons by acting within the peripheral and/or central nervous system. To find where PACAP exerted its effect, the authors electrically evoked trigeminovascular neuron responses and delivered receptor antagonists either by IV or intracerebroventricular (ICV) injection. While IV delivery failed to block evoked neuron responses, ICV delivery of VPAC1 or PAC1 antagonists inhibited those responses, suggesting that central but not peripheral receptors mediated activation of the trigeminovascular neurons. Yet serious doubts remain whether the findings prove that migraine is rooted in the brain. For instance, Dussor said that the effects of antibodies targeting calcitonin gene-related peptide (CGRP), which are in clinical trials for migraine (see PRF related webinar), point to a different conclusion. “You can treat a migraine by giving a CGRP monoclonal antibody peripherally,” said Dussor, even though these antibodies likely do not gain access to the brain. Additionally, “it’s possible that events in the periphery somewhere start activating pathways in the central nervous system that depend on PACAP receptors,” said Dussor. “These receptors centrally could still contribute to the process of migraine, but they don’t have to be the initiators,” he added. While future research will help address the relative contributions of central and peripheral mechanisms to migraine, one thing is certain: The findings add yet another nail in the coffin for the vascular theory of migraine. Image credit: Akerman and Goadsby, reprinted with permission from AAAS. Neuronal PAC1 receptors mediate delayed activation and sensitization of trigeminocervical neurons: Relevance to migraine. Sci Transl Med. 2015 Oct 7; 7(308):308ra157.